Thanks to Dr. Julie Guilmette, University of Montreal Hospital Center (Canada) and Dr. Delphine Desy, Maisonneuve-Rosemont Hospital (Canada) for contributing this case and discussion. To contribute a Case of the Week, follow the guidelines on our main Case of the Week page. (1) For 2016, we had a whopping 584 Job ads posted, compared to 498 in 2015, an increase of 17%. In December 2016 alone we had a record 62 job ads posted. We had 120 Conference ads posted in 2016, up from 84 ads posted in 2015. We posted 165 Fellowship ads in 2016 compared to 138 in 2015. These are record numbers for Jobs, Fellowships and Conference ads! We appreciate all our advertisers very much, as they help us provide this website to the pathology community for free. (2) We wish the best of luck to departing employee Shivani, who was Case of the Week coordinator for the almost 6 years she worked here. Shivani will soon be graduating from a nursing school. (3) We continually strive to improve our website, we have already converted more than 1/3 of the textbook topics to the new format. We also constantly add new topics, as well as content to old ones, and images, contributed by numerous pathologists from around the world. A 51 year old woman with no significant past medical history presented with a painless, 3 cm scalp nodule slowly increasing in size over the past 7 years, which was excised. A PET scan (called TEP in French) was negative. 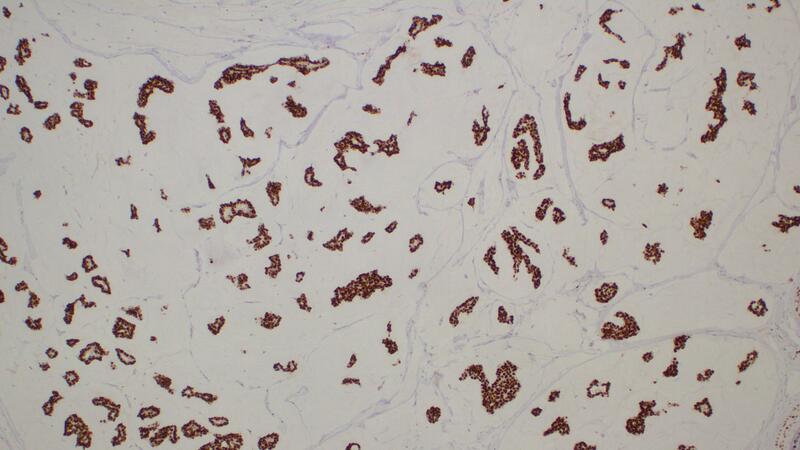 The neoplastic cells were positive for CK7, ER, PR and GATA3, and negative for CK20, CDX2, p40, CK5/6, GCDFP15, PAX8 and TTF1. Primary cutaneous mucinous carcinoma (PCMC) is a rare adnexal malignancy arising from eccrine glands. It usually occurs in the head and neck, in the face, eyelids and scalp. It has a slight male predilection and typically presents in the sixth decade as a solitary nodule that slowly increases in size over many years (Indian Dermatol Online J 2011;2:82). 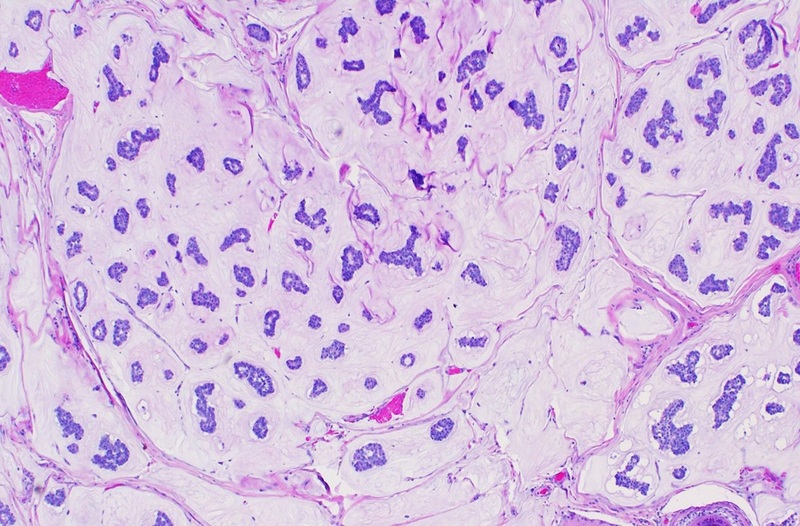 Histologically, PCMC shows small tumor cell clusters arranged in nests or cords floating in large pools of mucin separated by thin fibrovascular septa. 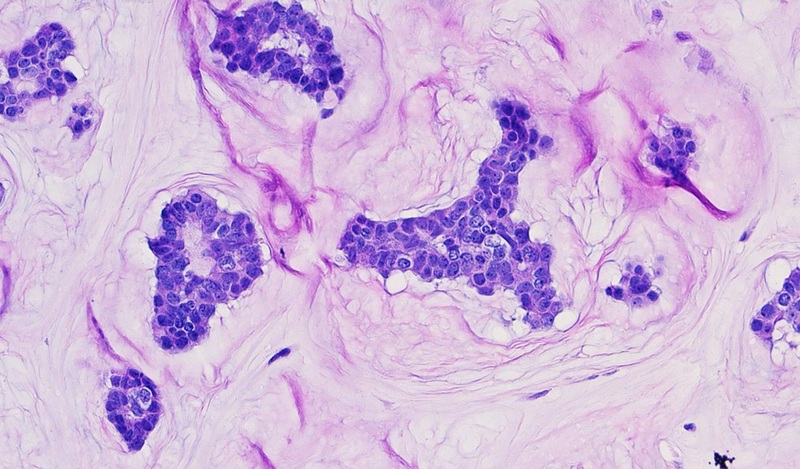 The tumor is usually dermal based with occasional infiltration into subcutaneous tissue. Nuclear grade is usually low. 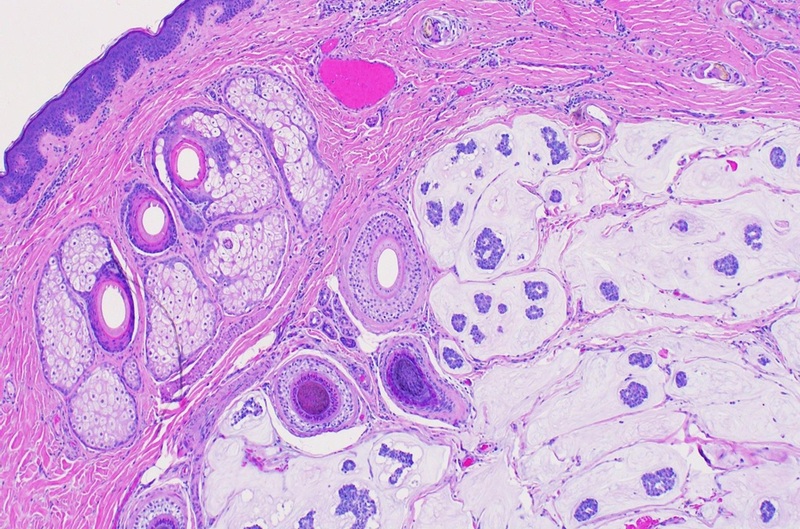 Tumor necrosis and mitosis are uncommon (Am J Dermatopathol 2004;26:353). The main differential diagnosis is metastatic mucinous carcinoma (MCC) from breast or colon, which are similar histologically (Am J Surg Pathol 2005;29:764, Am J Dermatopathol 2004;26:353), although mucinous breast carcinoma and mucinous colonic carcinoma only rarely metastasize to skin. When cutaneous metastases occur, the primary tumor is often well advanced and disseminated throughout the body (Am J Surg Pathol 2005;29:764). Clinicians should rule out an occult mucinous primary before making a definitive diagnosis of PCMC. Immunohistochemistry data is scant (J Cutan Pathol 2010;37:411), but may be helpful. 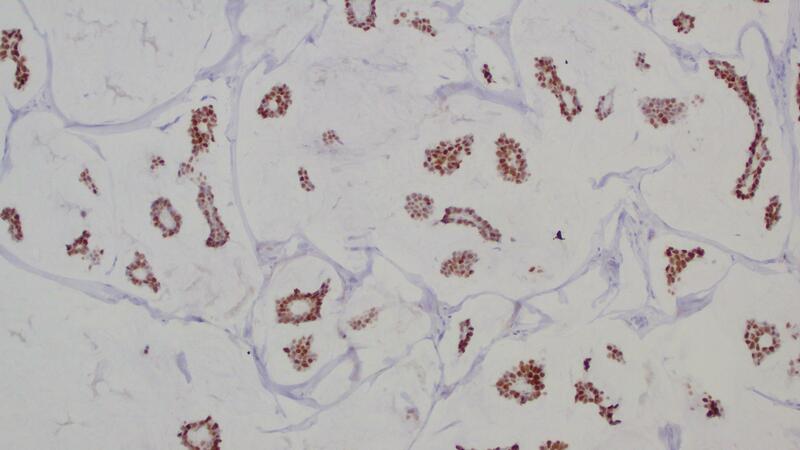 PCMC is typically positive for CK7, ER and PR, and frequently positive for breast markers, such as GATA3, mammaglobin and GCDFP15 (Am J Dermatopathol 2004;26:353), which is similar to mucinous breast carcinoma. 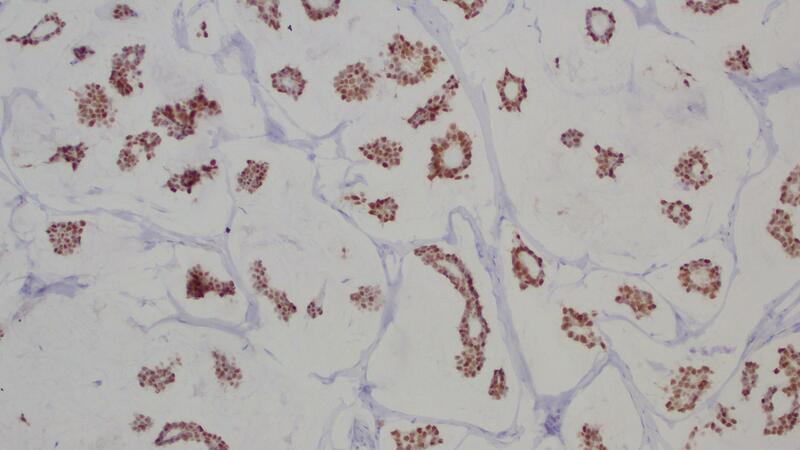 However, positive myoepithelial staining for CK5/6 and focally for p63 or p40 is seen in 20% and 40% of PCMC cases, but not in metastatic breast disease (J Cutan Pathol 2010;37:411). 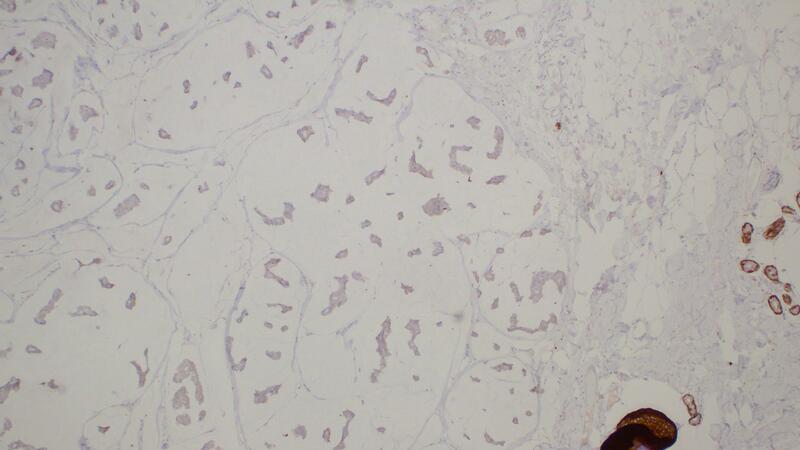 In mucinous colonic carcinoma, the neoplastic cells usually stain for CK20 but not CK7 (Indian Dermatol Online J 2011;2:82). PCMC is considered to have indolent behaviour. Management is surgical with complete excision aiming for generous margins (1 cm). Although systemic or nodal metastases are extremely uncommon, the risk of local recurrence is high, and necessitates long term follow up (BMJ Case Rep 2013 Feb 15;2013). A. Myoepithelial markers (e.g. 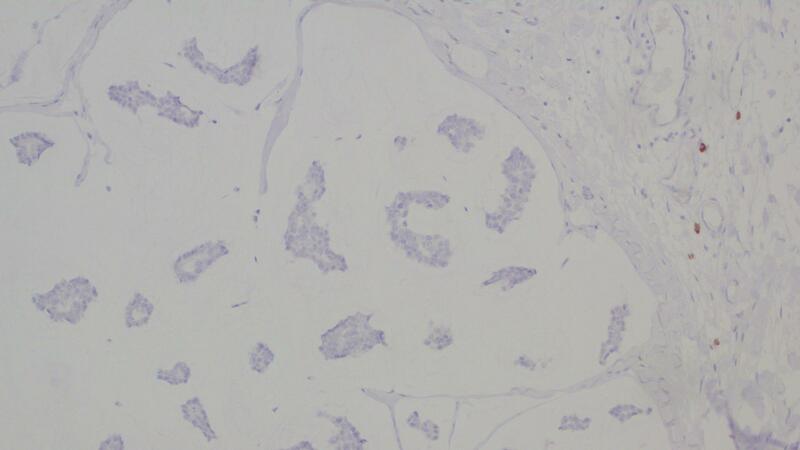 p63, CK5/6, SMMS) highlighting a layer of myoepithelial cells at the periphery of an in situ component, can aid in the distinction of PCMC from mucinous carcinoma metastatic from a breast (would not have an in situ component) or colonic primary. 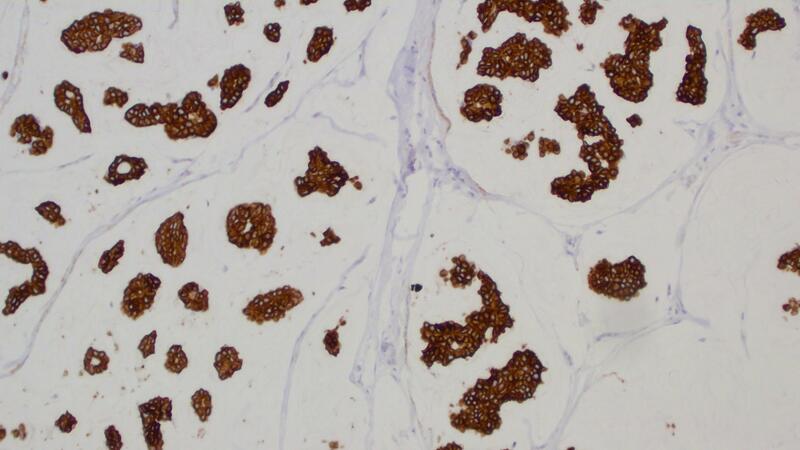 The pattern of staining is very important, as breast carcinomas with a basaloid phenotype may also demonstrate p63 and high molecular weight cytokeratins in a patchy to diffuse pattern.